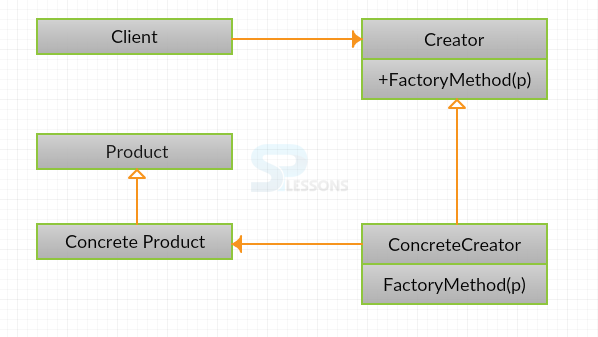 Factory method pattern, also referred as Factory Pattern, is the most commonly used design pattern. 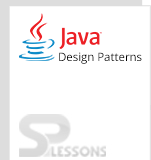 It is a sub category of creational pattern and is associated with object creation. In factory pattern, object can be created by hiding the logic to the client. So, factory pattern is known as “Virtual Constructor”. Factory method pattern makes the design completely customizable. There is a lot of difference between requesting an object and creating an object. A sub class can create its own objects. It uses loose-coupling and interacts with related interfaces and abstract classes. Product: Product is used to define the interface for objects that are created by factory method. ConcreteProduct: ConcreteProduct is used for implementing the Product interface. Creator: Also referred as Factory, it declares the method FactoryMethod, which returns a Product object. It calls the generating method to create the Product objects. ConcreteCreator :ConcreteCreater overrides the generating method to create the ConcreteProduct objects. Creating a class ComputerFactory and extending the features of Computerclass. Factory pattern can be used to code for interface rather than implementation. Factory pattern eliminates the process of instantiation of actual implementation classes from client code, thus making it more robust, less coupled and easy to extend. Factory pattern supports the abstraction between implementation and client classes through inheritance. Factory Design Patterns are mostly used in spring and struts as frameworks. The factory method is one of the most used and robust design patterns. The advantage of the Factory Method is that it can return the same instance multiple times, or can return a subclass rather than an object of that exact type.